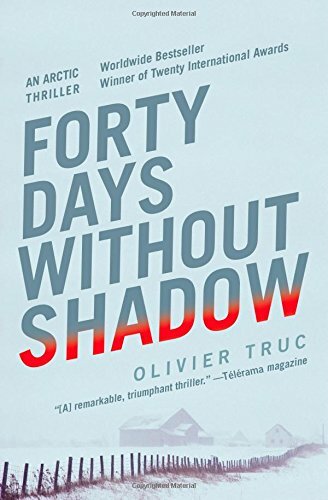 Olivier Truc’s hauntingly told Forty Days Without Shadow begins in the year 1693. An old man clutching a mysterious package is being pursued by howling dogs led by religious fanatics across the desolate landscape of Lapland. Eventually his pursuers catch up with him, but he no longer has the package. What has happened to it? And what’s its importance? Will torture or the threat of death loosen his tongue, forcing him to reveal where he has hidden it? Fast forward to present day. Forty nights of perpetual darkness are coming to an end for the small village of Kautokeino in northern Norway, home to the indigenous Sami nation. Alas, not all will survive. Along with the morning sun, something other than heat and light will emerge: murder. Cold-blooded murder in every sense of the word. Two mismatched cops, the experienced Sami officer Klemet Nango—who at one time was working in Stockholm on the Olaf Palme investigation—and younger partner Nina Nansen, assigned to reindeer-related crimes, investigate a complaint that one reindeer herd intermingled with another. To outsiders, this may not seem a big deal, but not to the herders and their families. To them, this is something akin to horse rustling in the old lawless Wild West. After documenting the crime, Klemet and Nina are soon investigating the fatal stabbing of herder Mattis Labba. Bad enough to have been stabbed to death, the unfortunate man also has his ears removed by the same weapon. This grisly attack coincides with the disappearance—or theft—from the local museum of a priceless relic, a drum belonging to the Sami nation. The drum is due to go on tour with a UN exhibition in a few weeks time. Are the crimes related, or simply coincidental? It’s up to Klemet and Nina to come up with the answer, but time is not on their side. To make matters worse, the villagers are naturally suspicious of “outsiders” and don’t take too kindly to having their dark past brought out into the light for all to see. Support and information from them is less than certain. One thing is certain though: Klemet and Nina will not be short of suspects or villains as they go in search of both drum and killer in an icy landscape of death and destruction. Forty Days Without Shadow is more that a splendidly told murder investigation and its consequences. It is a fascinating telling of bloody history, culture, and indigenous people struggling against all odds to survive. The winter scenes are frighteningly real, at times leaving you breathless and filled with awe. A book you will not forget. A powerful, ingenious piece of crime noir.